atouvap.fr • Consulter le sujet - LES BONS PLANS de HEAVENGIFTS en MAI ! LES BONS PLANS de HEAVENGIFTS en MAI ! Please don’t hesitate to join us. Good luck! Introducing you a new dual-battery mod equipped with 20700 batteries,iJoy Capatin. The Capatin is the first mod comes with 20700 batteries, which is now used on Tesla car, a safer and powerful replacement for previous 18650 battery. It features a maximum 234w power output, supports a minimum 0.05ohm vaping. Apart from bright big size screen, NI/TI/SS temperatur control function, TCR, it also has a unique custom user mode. What's more, Capatin mod supports USB charging. It is also customizable by changing its side pannels. Don't forget to use coupon code "AHG15" to get 15% off discount. The releasing of Geekvape Peerless has gotten many attention. It seems vapers are not satisfied with its current color options. Well, Geekvape listened the market voices, release a special edition which offer more color option including silver,black,gold, stainless steel, and all are made of stainless steel. Of course the special edition inherits all Peerless feature including large deck, 9-hole side airflow, connected juice well,etc. Don't forget to use "AHG15" to get 15% off discount. Introducing you a new structure RTA from Envii-Terra. The Envii is a completely U.S. brand, all devices are originally designed in U.S. Its Terra RTA is unparalleled when comes to flavor and clouds! This tank is rated for over 300 watts Whether you are looking to vape your face off or just looking for a nice hot vape. The inner structure of Terra is completely different from others. Vapers no longer need to screw and unscew to place the coils. And the maximum amount of coils is 8 depends on how much you wanna vape. Plus top filling, 5.5ml capacity, it is a one worth of your trying. Don't forget to use "AHG15" to have 15% off disoucnt. Introducing you the new goon style RDA from Wotofo, Serpent BF RDA. The tank features 2 independent posts with 4 big holes which is quite easy to rebuild coils on it. And it has 2 different mouthpieces, 528 goon style one for choud vaping and 510 drip tip for regular vaping. The tank also features bottom feeding technique which matches for bottom feed box mod. Besides, the embedded deck design prevents the leakage from happening. 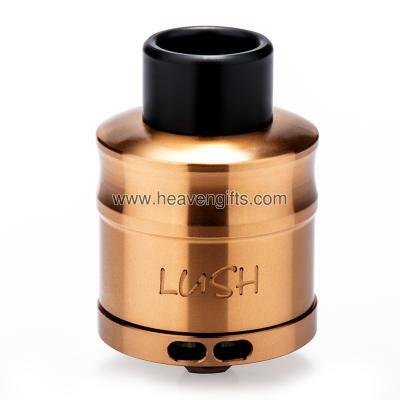 Its 3 side airflow holes provides enough air which supports dual coil. Plus its 24 gold plated contact pin with great electricity conductivity, Wotofo Serpent BF is the one worth of you trying. A premium vaping gear always stands out among so many products, just as Wotofo Lush Plus RDA, which received lots of favorable comments since its release. Now Wotofo adds 2 new colors – gold & rainbow to this new atty, providing you colorful vaping experience. All the features remain the same. As a 24mm RDA, it features a split-staggered two post build deck design with four wire holes, ensuring you to build various fancy coils. It has a deep juice well of 7.7mm to provide you with the largest juicing area possible. Just like many other wotofo tanks, this Lush Plus also adopts under-coil airflow system, namely, air flow coming in from two slots at the bottom of the deck, and up through the air holes beneath your coils, which really maximizes flavor and vapor density together with a reduced chamber. 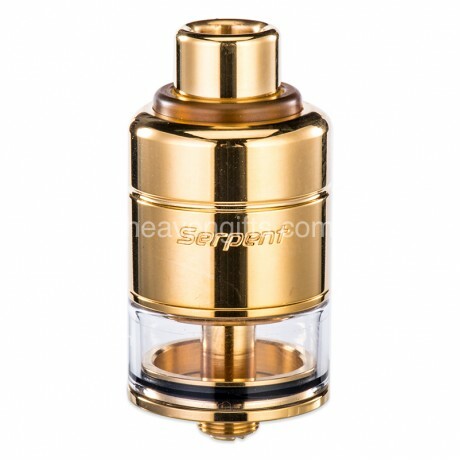 Plus it comes with the Derlin drip tip, German-made peek insulator as well as Gold-plated contact pin. If you dig this cute atty but step back by its common black or silver color, this new color version must be a good choice for you. Don't forget to use "AHG15" to get an extra 15% off discount! As the first RDTA from Wotofo, the Serpent RDTA drew the attention of many vapers with its unique clamped deck design and great flavor. 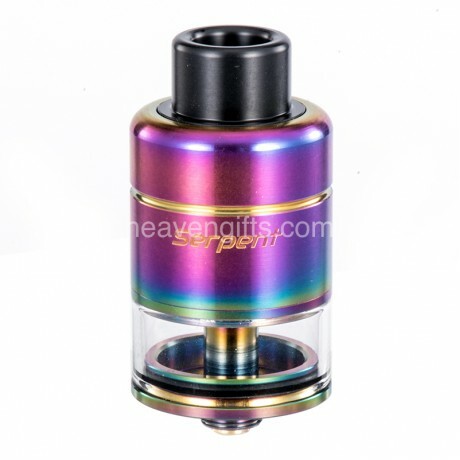 Now to meet more vapers's color preference, Wotofo add two new stylish colors to this tank, Gold and Rainbow. This new color version keeps the same good features such as stainless steel material, wide open dual-post clamped deck for big coils, adjustable huge bottom airflow and air holes redirected down to the coil design. You will enjoy better flavor and huge vapor from it. Don't forget to use "AHG15" to enjoy a 15% off discount. Introduce you guys another great single coil rebuildable tank - the Artisan RTA by Envii, a US brand. It features a removable postless deck for extremely easy building. And the interesting thing is the wire for the coils comes out of the opposite of the deck which enables you to make fast cuts underneath it. It also comes with an adapter for testing coils before cutting the wire, which means no more guess work. With a 22mm diameter, this Artisan RTA will perfectly pair with most small and mid sized mods. 3ml e-juice capacity meets most vapers' regular use. Plus convenient top filling, adjustable bottom airflow, gold plated contact pin, this tank will surely be favored by a few single coil builders. The GTA system got much attention when it's firstly introduced by Digiflavor. The success of Fuji and Siren give Digiflavor great confidence to improve and release another revolutionary GTA tank - the Pilgrim. Featuring the classice velocity style deck, it's compatible with both dual and single coil with the help of a ceramic block. It comes with 4ml e-juice capacity and convenient top fill system that supports two filling ways. And it adopts the adjustable side airflow system of a RDTA, offering you the best flavor. The PEI drip tip and tank are quite durable and heat resistant. Moreover, you can use both 510 and 810 drip tips with it, which means more flexible for drip tip choice. Obviously, this Pilgrim GTA tank combines the good features of both RTA and RDTA that worth your trying. It's no hard to see various box mods with unique design and great performance hit the market recently. Envii Loch Ness is such a creature that will draw your attnetion at first sight. With slightly curved shape and rubberized finish, it's so ergonomic and fits nicely in the hand. Powered by dual 18650 batteries that supports 150w max output, there is no doubt that it will offer you a stable and long-lasting vaping performance. Temp control mode supports Ni/Ti/SS heating elements alongside TFR and TCR modes. In addition, the dry sensing system (TC mode only) will remind you of "no liquid" when your atomizer is dry. The amazing thing is it offers two 510's; the catch cup 510 for 22mm atomizers as well as a flat cap 510 for 25-27mm bigger atomizers. And you can also upgrade its firmware to keep the device up to date. All in all, this Envii Loch Ness is a versatile high end box mod that will bring you a safe and enjoyable vaping experience!